Meetha Paan is the royal treat at end of the meal at most ceremonies in Indian. 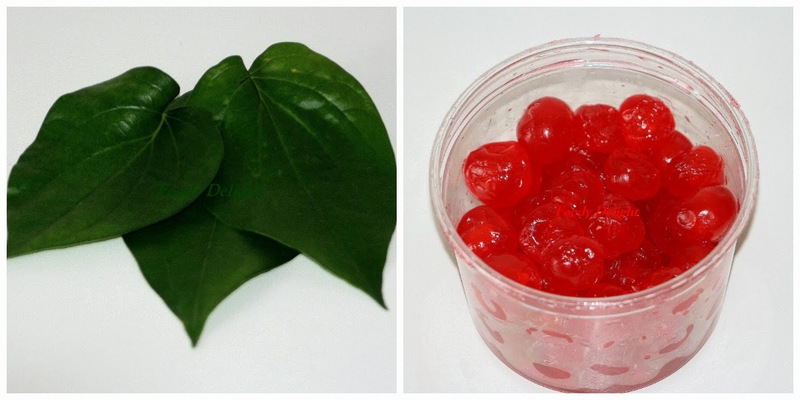 Paan or Betel leaf is the perennial evergreen herb with beautiful heart shaped leaf. Meetha paan can be prepared in various ways, loaded with fragnant and flavourful herbs and spices.The common ingredient used in the paan is the Gulkand, a jam made with petals of wild roses. Paan is actually good for digestion besides being used as as mouth freshener. If you have never tried a Paan. Go try this and I am sure you will never say no to this. Wash and pat dry the betel them using kitchen towel.Fold the leaf and slit the backside hard stalk of the paan leaf through out the halfway. Now roll one edge of the pan to form the cone shape. Like wise also roll the another edge to form a proper cone to keep all the ingredients. Now add gulkand, mukhwas, coconut flakes and pinch of cardamom powder. Enjoy Meetha Pan after lunch or dinner. Gulkand can be prepared at home by using home grown wild rose petals. But feel free to use readymade gulkand which is available at every Indian stores. Mukhwaas are also available in Indian stores in lots of varieties(flavours). Paans(Betel leaves) bought from the store can be kept fresh in the refrigerator by wrapping them into paper. wow . my fav. can I have one? Omg, beautiful mouth freshner,feel like having one. pass one paan to me please! absolutely irrestible! superb mouth freshner.... but where to get the ingredients??? can we get in any super market ? Hello Akila...Thanks for your comments. All the ingredients are available at the Indian stores. Looks so good, perfect for entertaining too! !